The Group of Twenty (G-20) is a forum for advancing international cooperation and coordination among 20 major advanced and emerging-market economies. The G-20 includes Argentina, Australia, Brazil, Canada, China, France, Germany, India, Indonesia, Italy, Japan, Mexico, Russia, Saudi Arabia, South Africa, South Korea, Turkey, the United Kingdom, and the United States, as well as the European Union (EU). G-20 countries account for about 85% of global economic output, 75% of global exports, and two-thirds of the world’s population. Originally established in 1999, the G-20 rose to prominence during the global financial crisis of 2008-2009 and is now the premier forum for international economic cooperation. Since the crisis, the G-20 leaders typically meet annually (at “summits”). Meetings among lower-level officials, including finance ministers and central bank governors, are scheduled throughout the year. G-20 meetings primarily focus on international economic and financial issues, although related topics are also discussed, including development, food security, and the environment, among others. 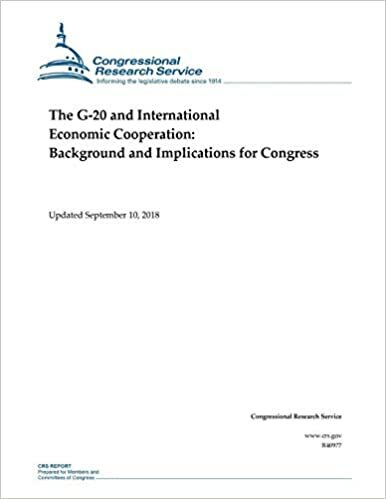 Congress exercises oversight over the Administration’s participation in the G-20, including the policy commitments that the Administration is making in the G-20 and the policies it is encouraging other G-20 countries to pursue. Additionally, legislative action may be required to implement certain commitments made by the Administration in the G-20 process. In 2018 Argentina chaired the G-20 in 2018 and hosting the annual summit on October 4-5 in Buenos Aires. Argentina’s theme for the year was “building consensus for fair and sustainable development.” To advance this agenda, Argentina proposed a focus on three key issues: (1) the future of work; (2) infrastructure for development; and (3) food security. In addition, Argentina will seek to build on previous G-20 work on empowering women, fighting corruption, strengthening financial governance, building a strong and sustainable financial system, improving the fairness of the global tax system, cooperating on trade and investment, taking responsibility on climate action, and transitioning toward cleaner, more flexible, and more transparent energy systems. The 2017 G-20 summit was contentious, with the United States increasingly isolated on trade and climate change issues. It is not clear that divisions on these issues have resolved over the past year. The G-7 summit hosted by Canada was also divisive, with President Trump withdrawing his initial support for the communiqué. Trade divisions have also arisen in G-20 discussions among finance ministers and central bank governors earlier this year. Meanwhile, Argentina is embroiled in its own financial crisis, with the government struggling to regain investor confidence following rapid depreciation of its currency and IMF program in June 2018. U.S. Leadership and Effectiveness of the G-20 The G-20 meeting and outcomes are contributing to ongoing debate about the U.S. leadership in the world under the Trump Administration. Some commentators are concerned that U.S. isolation at international summits reflects a growing trend of abdication of U.S. leadership and abandonment of U.S. allies. Others are more optimistic, arguing that differences between the United States and other countries were overblown and that President Trump is pursuing foreign policies consistent with his campaign pledges. The summit also raises questions about the G-20’s usefulness. Some argue it is a vital forum for a diverse set of countries to discuss their differences. Others wonder whether the G-20, which initially brought together leaders to coordinate the response to the global financial crisis of 2008-2009, has become less consequential over time. Purchase book.